James Sweet. Domingos Álvares, African Healing, and the Intellectual History of the Atlantic World. Chapel Hill, NC: University of North Carolina Press, 2011. Between 1730 and 1750, powerful healer and vodun priest Domingos Álvares traversed the colonial Atlantic world like few Africans of his time–from Africa to South America to Europe–addressing the profound alienation of warfare, capitalism, and the African slave trade through the language of health and healing. 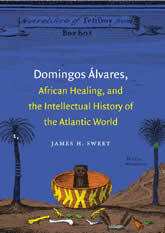 In Domingos Álvares, African Healing, and the Intellectual History of the Atlantic World, James H. Sweet finds dramatic means for unfolding a history of the eighteenth-century Atlantic world in which healing, religion, kinship, and political subversion were intimately connected.